To study the behavior of Acuros XB algorithm for flattening filter free (FFF) photon beams in comparison with the anisotropic analytical algorithm (AAA) when applied to homogeneous and heterogeneous phantoms in conventional and RapidArc techniques. 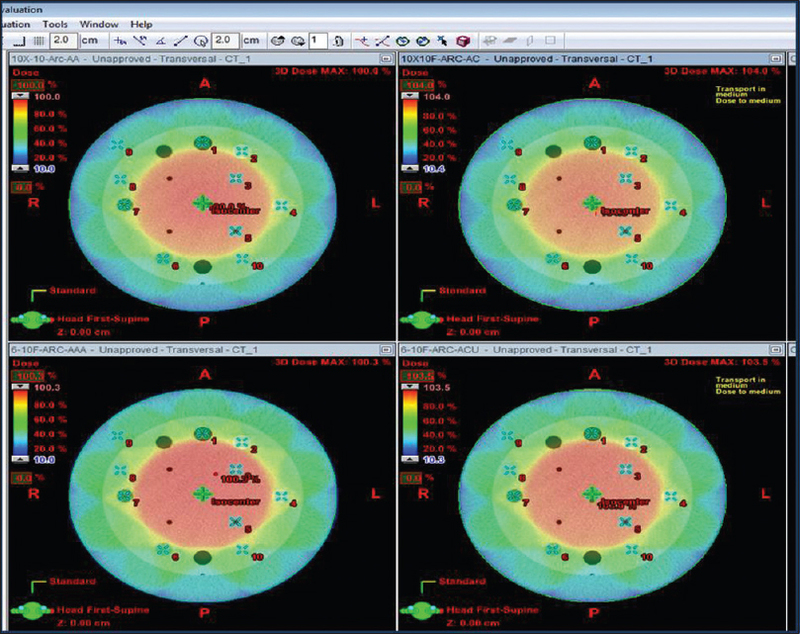 Acuros XB (Eclipse version 10.0, Varian Medical Systems, CA, USA) and AAA algorithms were used to calculate dose distributions for both 6X FFF and 10X FFF energies. RapidArc plans were created on Catphan phantom 504 and conventional plans on virtual homogeneous water phantom 30 × 30 × 30 cm3, virtual heterogeneous phantom with various inserts and on solid water phantom with air cavity. Dose at various inserts with different densities were measured in both AAA and Acuros algorithms. The maximum % variation in dose was observed in (−944 HU) air insert and minimum in (85 HU) acrylic insert in both 6X FFF and 10X FFF photons. Less than 1% variation observed between −149 HU and 282 HU for both energies. At −40 HU and 765 HU Acuros behaved quite contrarily with 10X FFF. Maximum % variation in dose was observed in less HU values and minimum variation in higher HU values for both FFF energies. Global maximum dose observed at higher depths for Acuros for both energies compared with AAA. Increase in dose was observed with Acuros algorithm in almost all densities and decrease at few densities ranging from 282 to 643 HU values. Field size, depth, beam energy, and material density influenced the dose difference between two algorithms. Stereotactic body radiation therapy (SBRT) is an emerging radiotherapy procedure. The major feature that separates SBRT from conventional radiation treatment is the delivery of large doses in a few fractions, which results in a high biological effective dose. In order to minimize the normal tissue toxicity, the conformation of high doses to the target and rapid fall-off doses away from the target is critical. The practice of SBRT, therefore, requires a high level of confidence in the accuracy of the entire treatment delivery process. Several authors reported on Acuros XB algorithm and its results in VMAT treatments and FFF beam modalities. According to Ojala, the accuracy of this algorithm was 1–2% for the homogeneous and heterogeneous water phantoms, 2% and slightly larger for single points and/or small regions and 3–5% for patient plans. According to the same author, the Acuros XB calculated dose distributions showed relatively high level of agreement in the light of 3D gamma analysis and DVH comparison against the full Monte Carlo simulation, especially with large peak-to-valleys (PTVs), but, with smaller PTVs, larger discrepancies were found. Rana et al. study on the phantom showed that the results of Acuros XB had better agreement with the measurements, and the difference ranged from −1.7% to 2.8%. We have recently commissioned Acuros XB, a new photon dose calculation algorithm in the Eclipse treatment planning system (TPS) (Varian Medical Systems, Palo Alto, USA). The current study was performed to assess the performance of Acuros XB algorithm against anisotropic analytical algorithm (AAA) in all modalities including arc plans, conventional plans in homogeneous and heterogeneous phantoms and also the use of FFF beams in VMAT technique. In external photon beam radiotherapy, heterogeneities in patients significantly affect dose calculations. Acuros XB algorithm accounts for the effects of these heterogeneities. Acuros XB uses a sophisticated technique for the development of explicit linear Boltzmann transport equation solution method to provide a rapid alternative to Montocarlo simulations, which are known to be time intensive. The AAA is an analytical photon dose calculation algorithm based on a pencil beam convolution/superposition technique. AAA source model consists of four components, (1) primary source (2) extra focal source (3) electron contamination and (4) photon scattered from the wedge. As we are not using a wedge in FFF, first three factors can contribute the difference between AAA and Acuros algorithm. Acuros XB patient transport works with the transport of source model fluence into the patient, calculation of scattered photon fluence in the patient, calculation of scattered electron fluence in the patient and dose calculation. In convolution/superposition algorithms heterogeneities are generally handled as density based corrections applied to dose kernels calculated in water. Acuros XB explicitly models the physical interaction of radiation with matter. For accurate dose calculation, Acuros XB requires not only density, but also the chemical composition of each material. To enable this Eclipse provides Acuros XB material library includes five biologic materials and 16 nonbiologic materials. To study the behavior of Acuros XB algorithm for FFF photon beams against AAA when applied to homogeneous and heterogeneous phantoms in conventional and RapidArc techniques, we have used four phantoms. One of the phantoms used for this study is Catphan 504 phantom (The Phantom Laboratory, Greenwich, NY, USA). The criteria for selecting this phantom [Figure 1] was that it has a spherical shape with more inhomogeneous with different known densities. Material inserts that were used were air, teflon, acrylic, deldrin, air and teflon rods, polystyrene and low density polyethylene with HU values −920, 643, 765, 282, −944, −40 and −149 respectively. The Catphan phantom is positioned on the CT-simulator couch by mounting it on the case. Additional weight is required to be placed on the lid to counterweigh the phantom. Position and level of the phantom were adjusted using lasers and mercury level to take 1 mm slice images. In Eclipse TPS a water phantom of size 30 cm × 30 cm × 30 cm was created using software tools. The relative electron density and HU values were identified as 1 g/cc and 0 HU. All sides of the phantom were closed to check the contour errors for the body. Total volume is homogeneous without any inserts. Virtual inhomogeneous phantom was prepared in Eclipse TPS to study the effect of various inserts on Acuros XB algorithm, having different relative electron densities and HU values. The total size of the phantom (body) was 40 cm x 40 cm x 40 cm with six different kinds of inserts each with 5 cm thick. The HU value and density of the body was equivalent to water. The inserts that were used were water (1.0 g/cc), cork (0.19 g/cc), polymethylmethacrylate (PMMA) (1.19 g/cc), air (0.0012 g/cc), polystyrene (1.05 g/cc), polyvinyl chloride (PVC) (1.38 g/cc) and wood (0.79 g/cc) having thickness of 5 cm each with HU values of 0, -788, 282, -993, 48, 605 and -309, respectively. Solid water slabs with density 1.03 g/cc and the total size of 30 cm × 30 cm × 30 cm were taken for this study. The phantom was prepared by combining multiple solid water blocks of size 30 cm x 30 cm having 5 cm and 2 cm thickness each. Another slab of 2 cm thickness with a cavity at the center for the chamber measurements was placed at the center of blocks so that the cavity will be at 10 cm depth from the surface of the phantom. Images with 1 mm slice thickness were acquired for this study in CT-simulator and were exported to the planning system. RapidArc plan with gantry angles from 181 to 179 with field size of 10 cm × 10 cm was planned by prescribing 1 Gy dose at iso-center on Catphan phantom 504. Calculations were done by both algorithms, AAA (version 10.0.28) and Acuros XB (version 10.0.28) in Varian Eclipse, using identical beam parameters with 6X FFF and 10X FFF photons from true beam linear accelerator in iso-centric technique. Central axis depth dose calculations were performed in virtual homogeneous phantom. Computations were done by both algorithms with 100 cm source to surface distance, and with field sizes of 1 cm × 1 cm-30 cm × 30 cm for 100 monitor units. Data were taken at various depths from Dmax to 30 cm for both 6X FFF and 10X FFF energies. Central axis depth doses calculations were performed in virtual inhomogeneous phantom [Figure 2]. Computations were done by both algorithms with SSD = 100 cm, monitor units = 100 for filed size 30 cm x 30 cm. Dose comparison was done at various points located below the inserts to study the behavior of algorithm with respect to material inserts in both FFF energies. Single direct SSD fields with size varying from 1 cm x 1 cm to 40 cm x 40 cm were used in this study. Dose at air cavity located at 10 cm depth was analyzed for both 6X FFF and 10X FFF energies in TPS. In all studies, for Acuros XB, we chose dose-to-medium option to calculate the dose in the phantoms. Dose calculation grid size of 2.5 mm was used for both the Acuros XB and AAA calculations. Eleven types of materials with different densities and HU values were studied in this work. Dose at these inserts were measured in both AAA and Acuros algorithm calculations for both energies in RapidArc technique [Figure 3]. The maximum % variation in dose between these two was observed in air insert (−944 HU) and minimum in the acrylic insert (85 HU) in both 6X FFF and 10X FFF photons. Less than 1% variation observed between −149 HU and 282 HU for both energies [Figure 4] and [Figure 5]. At −40 HU and 765 HU Acuros XB behaved quite differently in both 6X FFF and 10X FFF due to the composition of the material. There is a negligible dose difference in both energies for the insert with 6 HU to 282 HU value and at 765 HU. These results show that dose deposition not only depend on HU value but also on the composition of the material. The maximum (%) of variation in dose observed was 3.1% for 6X FFF and 2.8% for 10X FFF at HU value −944. The resultant numbers of MU were more with Acuros in both energies. In 6X FFF and 10X FFF, the difference is more in 10X FFF. The % difference is calculated using the following equation. In homogeneous phantom study, the maximum dose variation (1.3%) was observed for 20 cm × 20 cm field size and depth 1.5 cm for 6X FFF, for 10X FFF it was at 5 cm × 5 cm field size and 1.7 cm depth [Figure 6] and [Figure 7]. In Acuros global maximum dose observed at higher depths for both energies compared to AAA. Dmax occurs at deeper depths with Acuros XB for all field sizes for 6X and 10X FFF beams except in the case of 1 cm x 1 cm 10X FFF beam [Figure 8]. Virtual inhomogeneous phantom having different inserts with water (1.0 g/cc), cork (0.19 g/cc), PMMA (1.19 g/cc), air (0.0012 g/cc), polystyrene (1.05 g/cc), PVC (1.38 g/cc) and wood (0.79 g/cc) has shown clearly that the factors like density, HU value, composition of elements are contributing variations in dose distribution between these two algorithms. In water medium, there is a significant difference between algorithms for both 6X FFF and 10X FFF at lower depths (below 1 cm). At higher depths (more than 35 cm) there is a negligible dose difference. The maximum dose variation was observed in the air followed by PMMA and polystyrene. This study matches the results with the phantom 1 study. The variation was observed negligible in water at higher depths [Figure 9] and [Figure 10]. At depths 0.1 cm–1.0 cm in water the variations between AAA and Acuros were very high. These variations proportionately decrease as depth increases in both 6X FFF and 10X FFF. The maximum % of the variation observed was 11.96% at 0.5 cm depth, which came down to 1% at 2 cm depth in 6X FFF. Whereas in 10X FFF the maximum difference observed was 3.14% at 0.6 cm depth which came down to 1.11% at 2 cm in 10X FFF [Figure 11]. The dose difference observed at 10 cm depth in air cavity with 6X FFF and 10X FFF beams were 1.5–1.7% and 0.7–1.6% respectively for field sizes 1 cm × 1 cm to 30 cm × 30 cm [Figure 12]. FFF mode is the new concept in radiation oncology to implement very precise therapies such as stereotactic radiosurgery, stereotactic radiotherapy, and SBRT. Dose calculations present challenges due to FFF beam unique characteristics. The outcomes from these four phantom studies have shown agreement with other studies, which reported that the Acuros XB is more accurate for dose calculations in heterogeneous media compared to the AAA. This study also observed that the difference in results between the AAA and Acuros increases with decreasing HU values in both 6X FFF and 10X FFF energies which are in line with the results of Rana et al. study. This is due to the consideration of lower attenuation of photon beams within the lower density and improper modeling of scattered radiation contribution in AAA. Differences in dose calculations between Acuros XB and AAA algorithms were studied in a Catphan phantom for volumetric arc treatment delivery technique for a range of HU values that are clinically relevant. In our homogeneous phantom study with different field sizes in both energies found that the maximum dose variation observed was 1.3% at 1.5 cm depth for 20 cm × 20 cm field size. However our study showed that in case of heterogeneous phantom, the differences between Acuros XB calculated and AAA calculated doses were on the higher side which are in line with other reported results.,,,, Our study in air cavity located at depth 10 cm depth, the difference in dose observed between algorithms was 0.7% and 1.7% depending on the field size for both energies, are well matched with the results of few authors., According to Rana et al. also this is +2% for 6 MV photon beam of small field size that passes through large air gap or cavity. This work covered different kinds of phantoms, various kinds of inserts with different HU values using FFF beams and various treatment techniques including VMAT. Our future study and further verification of dose prediction accuracy of Acuros XB will be performed in different clinical situations. Increase in dose was observed with Acuros XB algorithm for both energies in almost all densities and decrease at few densities ranging from 282 to 643 HU values. Energy, field size and depth are also influenced the dose difference between two algorithms. In both 6X and 10X, Dmax is at higher depths in Acuros compared to AAA. Maximum depth dose differences were observed in air medium for both energies. Large differences in calculated doses were observed between the two algorithms in the buildup region of 6X FFF beam while for 10X FFF beam, the observed differences were minimal. Dose at air cavity at higher depths were significant in 6X FFF compared to 10X FFF. Georg D, Knöös T, McClean B. Current status and future perspective of flattening filter free photon beams. Med Phys 2011;38:1280-93. Xing L, Thorndyke B, Schreibmann E, Yang Y, Li TF, Kim GY, et al. Overview of image-guided radiation therapy. Med Dosim 2006;31:91-112. Scorsetti M, Alongi F, Castiglioni S, Clivio A, Fogliata A, Lobefalo F, et al. Feasibility and early clinical assessment of flattening filter free (FFF) based stereotactic body radiotherapy (SBRT) treatments. Radiat Oncol 2011;6:113. Mancosu P, Castiglioni S, Reggiori G, Catalano M, Alongi F, Pellegrini C, et al. Stereotactic body radiation therapy for liver tumours using flattening filter free beam: Dosimetric and technical considerations. Radiat Oncol 2012;7:16. Xing L, Lee L, Timmerman R. Adaptive radiation therapy and clinical perspectives. In: Image Guided and Adaptive Radiation Therapy. Baltimore: Lippincott/Williams and Wilkins; 2008. p. 16-40. Ong CL, Verbakel WF, Cuijpers JP, Slotman BJ, Lagerwaard FJ, Senan S. Stereotactic radiotherapy for peripheral lung tumors: A comparison of volumetric modulated arc therapy with 3 other delivery techniques. Radiother Oncol 2010;97:437-42. Bree Id, van Hinsberg MG, van Veelen LR. High-dose radiotherapy in inoperable nonsmall cell lung cancer: Comparison of volumetric modulated arc therapy, dynamic IMRT and 3D conformal radiotherapy. Med Dosim 2012;37:353-7. Ojala J. The accuracy of the Acuros XB algorithm in external beam radiotherapy – A comprehensive review. Int J Cancer Ther Oncol 2014;2:1-12. Ojala JJ, Kapanen MK, Hyödynmaa SJ, Wigren TK, Pitkänen MA. Performance of dose calculation algorithms from three generations in lung SBRT: Comparison with full Monte Carlo-based dose distributions. J Appl Clin Med Phys 2014;15:4662. Rana S, Rogers K, Pokharel S, Cheng C. Evaluation of Acuros XB algorithm based on RTOG 0813 dosimetric criteria for SBRT lung treatment with RapidArc. J Appl Clin Med Phys 2014;15:4474. Tillikainen L, Helminen H, Torsti T, Siljamäki S, Alakuijala J, Pyyry J, et al. A 3D pencil-beam-based superposition algorithm for photon dose calculation in heterogeneous media. Phys Med Biol 2008;53:3821-39. Failla GA, Wareing T, Archambault Y, Thomson S, Transpire Inc, Gig Harbor, Washington. Accuros XB advanced dose calculation for eclipse treatment planning system. Palo Alto, California: Varian Medical Systems; 2010. The Phantom Laboratory Catphan ® 504 Manual; Greenwich, NY12834; 2013. Kan MW, Leung LH, Yu PK. Verification and dosimetric impact of Acuros XB algorithm on intensity modulated stereotactic radiotherapy for locally persistent nasopharyngeal carcinoma. Med Phys 2012;39:4705-14. Rana S, Rogers K, Lee T, Reed D, Biggs C. Verification and dosimetric impact of Acuros XB algorithm for stereotactic body radiation therapy (SBRT) and RapidArc planning for non-small-cell lung cancer (NSCLC) patients. Int J Med Phys Clin Eng Radiat Oncol 2013;2:6-14. Vassiliev ON, Wareing TA, McGhee J, Failla G, Salehpour MR, Mourtada F. Validation of a new grid-based Boltzmann equation solver for dose calculation in radiotherapy with photon beams. Phys Med Biol 2010;55:581-98. Bush K, Gagne IM, Zavgorodni S, Ansbacher W, Beckham W. Dosimetric validation of Acuros XB with Monte Carlo methods for photon dose calculations. Med Phys 2011;38:2208-21. Fogliata A, Nicolini G, Clivio A, Vanetti E, Cozzi L. Dosimetric evaluation of Acuros XB advanced dose calculation algorithm in heterogeneous media. Radiat Oncol 2011;6:82. Han T, Mourtada F, Kisling K, Mikell J, Followill D, Howell R. Experimental validation of deterministic Acuros XB algorithm for IMRT and VMAT dose calculations with the Radiological Physics Center's head and neck phantom. Med Phys 2012;39:2193-202. Papanikolaou N, Battista JJ, Boyer AL, Kappas C, Klein C, Mackie TR. Tissue Inhomogeneity Corrections for Megavoltage Photon Beams. Report of Task Group No. 65 of the Radiation Therapy Committee of the American Association of Physicist in Medicine. AAPM Report No. 85. Available from: http://www.aapm.org/pubs/reports/rpt_85.pdf. [Last accessed on 2015 Jul 10]. Sievinen J, Ulmer W, Kaissl W. AAA Photon Dose Calculation in Eclipse. Varian Documentation RAD #7170B; 2005. Rana S, Rogers K. Dosimetric evaluation of Acuros XB dose calculation algorithm with measurements in predicting doses beyond different air gap thickness for smaller and larger field sizes. J Med Phys 2013;38:9-14.